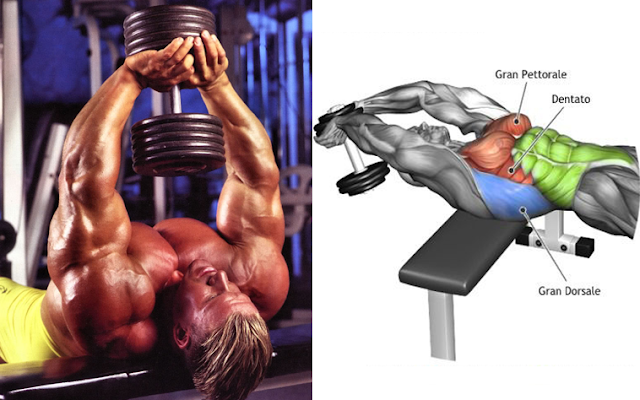 Lie back on a flat bench. Using a close grip (shoulder width), lift the bar from the rack and hold it straight over you with your arms locked. As you breathe in, come down slowly until you feel the bar on your middle chest. After a second pause, bring the bar back to the starting position as you breathe out and push the bar using your triceps muscles. Lock your arms in the contracted position, hold for a second and then start coming down slowly again. Ensuring that the dumbbell stays securely placed at the top of the bench, lie perpendicular to the bench (torso across it as in forming a cross) with only your shoulders lying on the surface. Hips should be below the bench and legs bent with feet firmly on the floor. The head will be off the bench too. 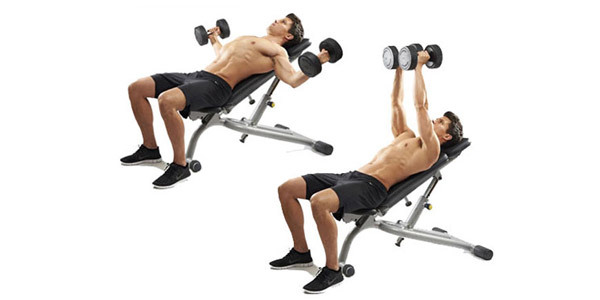 Grasp the dumbbell with both hands and hold it straight over your chest at arms length. Both palms pressing against the underside one of the sides of the dumbbell. Bring the dumbbell back to the starting position using the arc through which the weight was lowered and exhale as you perform this movement. 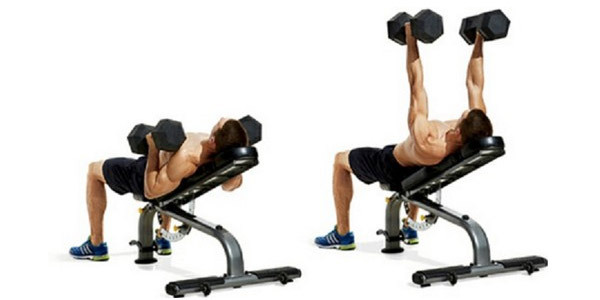 Lie back on an incline bench with a dumbbell in each hand on your thighs. The palms of your hands facing each other. Using your thighs to help push the dumbbells up, lift the dumbbells one at a time so that you can hold them at shoulder width. Keep full control of the dumbbells at all times. Then breathe out and push the dumbbells up with your chest. Lock your arms at the top, hold for a second, then start slowly lowering the weight. 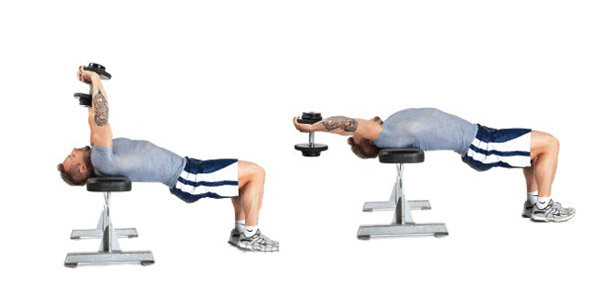 Hold a dumbbell on each hand and lie on an incline bench that is set to an incline angle of no more than 30 degrees. Extend your arms above you with a slight bend at the elbows. Rotate the wrists so that the palms of your hands are facing you. Breathe in and start to slowly lower the arms to the side while keeping the arms extended and rotating the wrists until the palms of the hand are facing each other. As you exhale start to bring the dumbbells back up to the starting position by reversing the motion and rotating the hands so that the pinky fingers are next to each other. 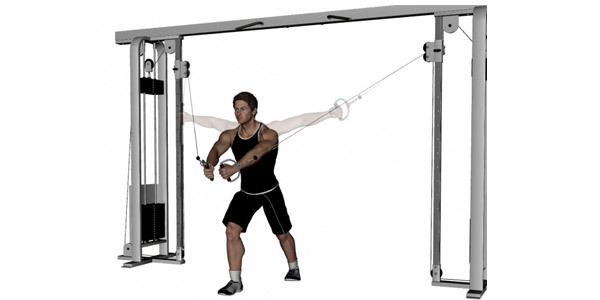 Place the pulleys on a high position (above your head), select the resistance to be used and hold the pulleys in each hand. Step forward in front of an imaginary straight line between both pulleys while pulling your arms together in front of you. Your torso should have a small forward bend from the waist. With a slight bend on your elbows, extend your arms to the side (straight out at both sides) in a wide arc until you feel a stretch on your chest, breathe in. thanks for information . i like your post . If you’re searching for a legal Dianabol option, then you might have come throughout D Bal, Drill Master and also D-Bal Max. Check out more about. Nice and informative info shared! I truly like the valuable info you had provided to your article its very helpful and I will definitely try these tips for a best body. 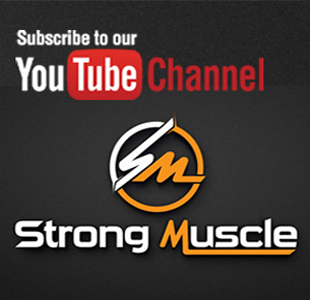 I too like to share some good and informative point which is essential for bodybuilding is natural and good supplements. And for that I always prefer to use Maxno in order to have a best body without any side effect to the body. It's truly a must try for every individual. See the MaxNo Extreme muscle builder supplement and judge yourself. Exercise boosts energy. Regular physical activity can improve your muscle strength and boost your endurance. Exercise delivers oxygen and nutrients to your tissues and helps your cardiovascular system work more efficiently. And when your heart and lung health improve, you have more energy to tackle daily chores. And after my exercises, I like to have the best hgh supplements for a stronger and fitter body. I would like to recommend it to every individual as it's natural and does not cause any harm to the body. It's a must try! In any case, there are still some over-the-counter fat consuming enhancements that may respond antagonistically to a lesser degree on your body framework.https://www.imedix.com/drugs/erectile-dysfunction/levitra-vardenafil They could trigger off a few hypersensitivities and gentle body responses dependent on individual body physiology, yet such are not by any stretch of the imagination a noteworthy concern, else they would have been evacuated over the counter by the pertinent experts. Purchasing drugs from the net is explicitly helpful for people requiring mass requests. The conveyance framework is exceptionally advantageous vardenafil for the individuals who live in remote regions. Exercise is mostly boring, painful and smelly, so those who endure it for about an hour,Home Body Guide 3-5 days a week, have achieved a level of discipline most only dream of.